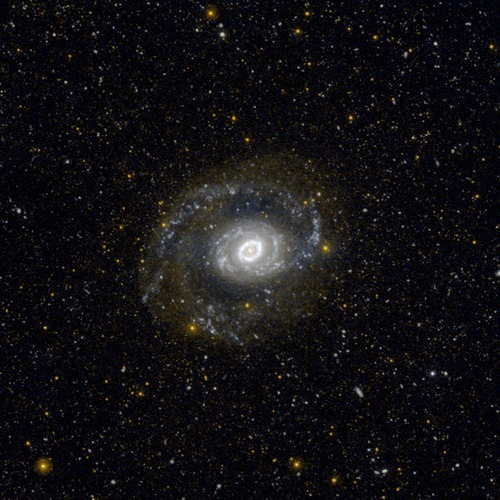 This image from NASA's Galaxy Evolution Explorer (GALEX) shows Messier 94, also known as NGC 4736, in ultraviolet light. It is located 17 million light-years away in the constellation Canes Venatici. The spiral galaxy is punctuated by a distinct ring of stars at its center. The young stars glow with ultraviolet light and thus appear bright to the detectors of GALEX. Astronomers think the galaxy's oval shape may be the reason for this sharp ring of star formation. The ultraviolet light at the very center of the galaxy, within the ring, is likely produced by a combination of extremely old stars, about 10 billion years old. GALEX highlights the complex star formation history in the outer arms as well. There, the blue-white regions highlight areas of current star formation, and the diffuse faint red light is from regions where star formation ceased more than 100 million years ago.